These chicken patties are just as savoury and juicy as beef burgers. A fresh green salad is the perfect pairing for this chicken recipe. If you are tight for time after work, make the patties up to a day before cooking and serving. Combine chicken, egg whites, Stove Top and garlic in large bowl. Roll into 20 balls; flatten to 1/4-inch thickness. Place patties on rimmed baking sheet sprayed with cooking spray. Bake 20 min. or until done (165ºF). 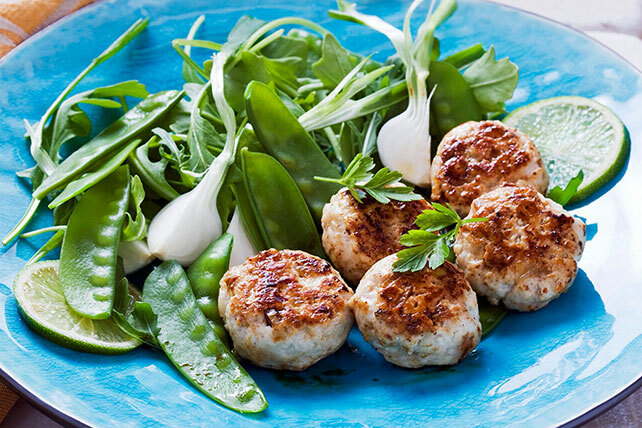 Mix arugula, snow peas, and onions in large bowl; divide evenly among four plates and top with chicken patties. Drizzle with dressing before serving. Garnish with thin lime rounds and parsley. Dip each patty in 2 Tbsp. flour, turning to coat both sides. Gently shake off excess flour. Heat 1 Tbsp. oil in large deep skillet on medium-high heat. Add half the chicken patties; cook 3 to 4 min. on each side or until done (165ºF) and golden brown on both sides. Drain on paper towels. Repeat with remaining patties; cover to keep warm. These patties can be shaped ahead and refrigerated overnight; let stand for 30 min. before cooking.